We're all jointly going to be introducing a few spooky places to Death Clicks - places we've personally visited and felt ... something ... even if it's just a frisson of fear because we'd been told it's haunted. Leith Hill Tower on the South Downs (on Leith Hill, to be precise. Who would have thought?) in England was one of the first so-called haunted places I visited as a child. The story went that a pair of large (hairy) ghostly hands (or sometimes arms too) would try to push you off the top of the tower if you visited after dusk. I've not found any reference to the haunting story on the Internets so any confirmation of it would be great. I remember my first visit as a child was scary - because of the story of the haunting but also because at the time the place was pretty run down and it seemed just too plausible that one could be pushed off the top or fall between the crenelations. I could feel something in the atmosphere of the place, though, especially on the roof - enough to make the back of my neck tingle and want to keep turning round to see what was behind. We didn't stay there long. I also had my first "I can fly" primordial connection moment up there (the second being at Tintagel and the third at La Sagrada Familia, for completeness). Anyway, Leith Hill Tower sticks up like Glastonbury Tor over the South Downs, and is the highest point in South Eastern England. It now feels much safer, with a nice National Trust gift shop and safety-friendly handrails. But on the roof ... did I feel something again? Visit if you get the chance, and let us have your opinion. On this date (or yesterday, there is some debate) in 1973 Albert DeSalvo AKA the Boston Strangler was stabbed to death in the prison infirmary. He was imprisoned for sexual assault and other related charges. Despite confessing to over 6 murders attributed to the Boston Strangler, he was never charged. Nor was anyone ever prosecuted for his death. There is much debate about the Boston Strangler murders. Public opinion at the time linked all similar rapes and murders together, but for a variety of reasons (range of ages of women, different methods of kiling) the police did not believe all murders were the work of one person. 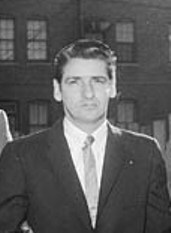 Some believe that DeSalvo was innocent or was part of a two-man team. The mysteries surrounding these murders have inspired multiple films including The Boston Strangler in 1968 based on DeSalvo as the killer and The Strangler which was made while the crimes were still considered unsolved (i.e. before DeSalvo confessed). A further macabre footnote to this story occurred in 2001 when DeSalvo's family had his body exhumed hoping to clear his name and discovered that many of his organs were missing. So having revisited Pete McCarthy's book where he writes about his visit to Port Arthur (a small town but mainly a penal colony off the southern coast of Tasmania), I actually feel even less qualified to write a post about it. Nearly everyone who visits there comments on the visceral feeling of dread the place evokes, and as the closest I ever got to it was a trip to the Manly pie shop near Sydney, the only dread I felt in Australia was cholesterol-related. The prison, once known as hell on earth, has a ghost tour, which by all accounts is absolutely fricking terrifying, just because the atmosphere is so doom-laden. McCarthy bailed on the tour but had his own ghostly experience in a probation station block some distance from the prison complex. The ghost tours have been running for 20 odd years and and in that time 1,800 apparitions have been reported. Haunted was an Australian documentary from the 80s that visited Port Arthur. McCarthy has some interesting ideas on both the idea of prisons within prisons, and horrors upon horrors. Port Arthur was the place where re-offending convicts in Australia got sent (and in those days it didn't take much to get sent to Australia for 14 years hard labour in the first place: stealing shoes, a handkerchief or even a loaf of bread was enough to get you sent half way around the world in horrendous conditions). Most examples of recidivist behaviour seemed to be "drunkeness". Tassie was even wilder and more remote than the Australian mainland, and the convict colony was on a peninsula that was guarded by a line of tethered half-starved dogs by land and sharks by water. If the wider scope of Port Arthur wasn't enough to curb any unwanted tendencies, they had "The Model Prison" which was considered forward thinking for its time (bearing in mind a standard punishment was 100 lashes - with a trip to the reviving room to have salt water thrown on your wounds if you had the cheek to pass out - leaving your back like liver and straight back to work for you afterwards). The punishments inflicted in the model prison were psychological: various types of sensory deprivation, and could escalate all the way to solitary confinement in absolute darkness, in an asymmetrical shape, with meals bought at irregular intervals so there was no point of reference to help hang on to sanity. Even those in solitary confinement had to attend church. The chapel had enclosed booths where the prisoners were led, hoods covering their faces until they were shut into the pews, unable to see any of their fellow offenders, only the chaplain at the front. Even photographs of the place are unnerving. No executions were ever carried out but many convicts died and are buried in unmarked graves on the Isle of the Dead. And then, from the prisons within prisons, to the horrors upon horrors. Port Arthur had always had a fearsome reputation and haunting atmosphere, but then in 1996 was the setting for the worst mass-murder event in modern Australia. There are signs up asking tourists to please not discuss the event with the staff. One can't imagine the effect it must have had on an already scarred atmosphere ... fractured is the word one visitor used to describe it. He used to have entire human skeletons as a teenager. The Dublin Bone Shop would sell a complete set of hand bones for 5 shillings. By the time I came along he’d reduced his collection to a few skulls, a pelvis, and the hand. Rummaging in the attic was a bit tense, as you never knew quite what you’d grab a hold of. I was told a lot of the medical specimens from the bone shop came from casualties of Italy’s invasion of Abyssinia. I’m not sure of the truth of this, but no irate Ethiopian spirit came to tell me off for putting marbles in his eye sockets or taking his hand to a Halloween boat cruise. I suppose at least the bones were treated with affection if not what one could describe as respect. A cemetery that was prone to overcrowding and soil erosion makes for a great combo. Jawbones hanging out of the roots of hedges. There was a brick enclosure there, filled with gravel. I was told that it was where they put bones that got disinterred when new burials were being made. Then my dad put me in the enclosure … as an impromptu playpen for a 5 year old, it worked pretty well. The volume of bones ends up being overwhelming. It was thought the cemeteries of Paris were a health hazard, so all the bodies were disinterred and placed in the Catacombs. A plain badly lit walk along dripping tunnels only serves to heighten the fear before you actually confront the bones. And my god there must be millions of people there. Stacks of skulls and thighbones, each labeled with a plate explaining which cemetery the remains were from. By the time you emerge, into daylight, it’s such a relief you don’t even care you’re in a seedy unmapped back street kilometers from where you entered. Capuchin monks were seriously nuts. Once dead, they liked to lose the flesh and then have their bones wired into various displays to remind everyone of mortality. Various displays including grim reapers complete with scythes … it’s amazing what you can do with a few femurs and clavicles. The one place I haven’t been that I’m going to include on the list, just because it has to be the best place ever to see bones, is Sedlec Ossuary in the Czech Republic. The soil in the cemetery there included some bought back from Golgotha (which, if I remember my Man from U.N.C.L.E. education … or am I getting confused with evil villian Sardonicus … meant Place of the Skull). It made the burial site very appealing and very crowded. If you personally find you ever have this combination, please don’t then put a half-blind mad monk in charge of tidying up the bones, as you will then find he’s gone a bit bananas. He’s most likely have made Chandeliers, coats of arms, and all sorts of knickknackery that makes the Capuchins look total amateurs. Take the name of your first pet then add the last name of your favourite mystic, psychic, medium, or spiritualist and voila your very own Death Clicks name! You can email your name or any famous figures you'd like us to feature in future Death Clicks posts to dailydeathclicks@gmail.com and we'll share some of the best. Today is the anniversary of the assassination of John F. Kennedy. Here are some photos, taken by me of Dealy Plaza (an X and a plaque mark the location where the fatal shot occurred), the JFK Memorial plaza roughly 200 yards east of the book Depository. To add some more mystery and speculation to this piece of history, some believe that JFK was the reincarnation of Abraham Lincoln or at the very least that there are a shocking number of similarities between the lives and careers of these two famous Presidents. Many of these similarities have been debunked. One (unverified) legend also links these two presidents, claiming that JFK believed he regularily received advice from Lincoln's ghost - which would be like talking to himself, if both legends are true. The Evening Standard story about a car crash on the A3 in Surrey, England is one of the most perfect modern ghost stories. The A3 is a very busy highway in the UK that runs through Surrey and into the centre of London. In December 2002, motorists called police to report witnessing an accident: more than one driver reported that they saw a car swerve off the road, headlights blazing. Police went to investigate, and when they checked the undergrowth along the roadside, they found the wrecked car - nose-down and invisible from the highway - with a body inside. The car had been there since July. Five whole months. The corpse was decomposed and had to be identified by dental records. The one problem I have with this story, is why there are no named witnesses. The motorists who reported seeing the crash are all anonymous. Because they don't really exist? Because they don't want to be labelled as nuts? Tweeting about Charles de Lint's House on Spadina experience this morning made us realize that Toronto has some pretty impressive supernatural credentials. While Spadina seems, bizarrely, to be quite a focal point for UFO encounters (apparently there's even one Toronto doctor who specializes in treating abductees), probably the city's coolest claim to phantom fame is that of the Philip Experiment. Back in the 1970s, a group of non-believers got together, solely to "create" a ghost. The results were amazing. For ages, there were only elusive out of print books referring to the experiment, so finally being able to see footage of the manifestations is pretty awesome! The experiment also inspired one of the most genuinely scary supernatural fiction books ever: The Supernatural by David Ambrose. So, I found this post I'd written waaay back in 2004 on the Fortean Times forum, and it seemed worth dusting off, particularly after the tweet about "please don't embellish or try and add atmosphere". It's worthy advice, otherwise stories really do just force themselves to be filed under Too Good to be True. As someone who would like to believe, sometimes my innate skepticism annoys me, but I think we owe it to ourselves to always, always discount all rational explanations. It doesn't always make people happy, but again if someone takes sensible questioning too personally, it makes me automatically question the integrity of a story. Occam's Razor, kids! Hello all! It's my first time posting here and just wanted to mention an experience I had, namely, back in May or June of 1992, I experienced what I can only think was a time slip. Going up to London with a new boyfriend, we caught a train to Waterloo and then headed down into the underground. I can’t remember which entrance we took: I just remember heading down the escalators and seeing scraps of paper lazily blow past me up the other way. That was the first hint of weirdness. The paper wasn’t gusting like it normally would in the blast of subway air – this was deliberately slow mo. It was at that point that I think I sensed the shift in atmosphere. From the normally bustling energy of Waterloo on a Saturday, it segued into a heavier depressing gloom. Everything was too quiet. Even though there were still people around, they all seemed subdued. It was almost like being underwater. At the foot of the escalators, there were lines and lines of string, like multitudes of washing lines. Bits of cloth and rag were hung up on the lines, as though makeshift camps had been set up all along corridors and in any available spaces. It wasn’t just a couple of isolated areas, it felt like all the passages had been turned into living areas or camps. I don’t remember which underground line we were taking, but we seemed to be walking far further than usual. The strangest thing was, I felt so tense and at a gut level KNEW that the surroundings had flipped into something more alien, yet it never occurred to me to say something to my boyfriend. Standing in a corner was a man in official uniform – I don’t really remember him, just have a sense that he was bareheaded, had shiny buttons on his jacket – whose presence made me feel no less uneasy. I was trying to convince myself that if he was there, it meant that all the weirdness of the clothes lines were somehow explicable. Only afterwards, when my boyfriend and I compared notes did we realise that we both sensed something archaic about his outfit and demeanour. By the time I got on the semi-crowded tube train, I was beginning to feel seriously panicked. Sitting across from us was a man who looked close to tears, red faced, breathing frantically, a really scared expression on his face. My boyfriend gave a surreptitious nod in his direction – the first clue I had that I wasn’t actually the only one experiencing something disquieting. Then my boyfriend whispered, "Look, him too," and there was another man further down the carriage who looked in fear of his life. At that point, it STILL didn’t occur to us to ponder what the hell was going on – we just both thought that maybe we had a premonition or something and ought to get off the train immediately. Only afterwards did we realise it totally felt strange from the moment we headed down into the underground station. I guess we both assume that maybe it was some kind of time slip or overlay back to maybe the second world war – I don’t know if they turned any parts of Waterloo stations into shelters. Sorry it’s not as dramatic as hanging out with Marie Antoinette in Versailles, but it still creeped me out big time, and whenever I think about it, I still recall just how scared it made me. Can ghosts be stirred up by home renovations and improvements or bigger construction? Hauntings or paranormal episodes following home renovations is the topic of an article recently featured in the Fortean Times. This acquaintance (let's call him Joe) wanted to buy a house. Joe found a property that seemed promising on a quiet residential street in the city so he decided to visit the open house scheduled for the weekend. Upon arrival Joe could see signs that the house had been very quickly and very badly flipped. Despite this Joe decided to take a look through the whole house and was pleasantly surprised by the third floor which had two dormered rooms that had been relatively untouched during the renovations. Joe entered the first unfurnished room, enjoyingthe original features and details. It was in this mood that Joe entered the second room. This room contained only a rocking chair across from the door, which Joe began to approach as he walked more fully into the room. The closer Joe got to the chair the more he felt emotions of anger, sadness, and desperation grow, until half way across the room Joe felt as though someone screamed in his head "Get out of my house!! Leave me alone!" then more quietly "this is the only place I have left that's still mine". Joe immediately backed up to the entrance of the room and the feelings quieted, but he couldn't shake the sense that there was a presence sitting in the rocking chair. Joe heard the steps of other potential buyers coming up the stairs to the third floor and left the room and not longer after the house. He decided not to buy this particular home. Joe exhibited the ability to hear the dead, this ability is often called clairaudience or psychic hearing by believers. Edinburgh has a fantastically horrible history literally layered throughout the city. One of the city's above ground treasures are the kirkyards (graveyards to non-Scots). The Death Clicks icon is a photo taken in, perhaps the most famous of Edinburgh's kirkyards, Greyfriar's Kirk and Kirkyard. The image captures an orb that did not appear in any subsequent images (i.e. not a spec or rain on the camera), also notice the orb is moving but the image isn't blurred. Of course it's possible it's not evidence of a restless spirit and just refracted or reflected light...you decide. Have your own photos of orbs you want to share, send them to dailydeathclicks@gmail.com. Also in the Kirkyard are some spectacularily detailed and macabre monuments and tombs. A unique feature of this graveyard is the outdoor cells used to imprison Covenanters in the 17th century. Some say the prisoners who died from exposure and disease in these outdoor cells (let's face Scotland isn't known for being balmy) still haunt the cells. For more on the Covenanters click here, or visit the Greyfriar's photo gallery (see plaque photo). 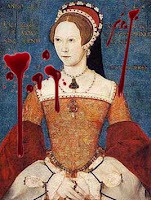 Bloody Mary, aka Mary I, who died 452 years ago today got her soubriquet from the Marian Persecutions where she had 300 religious dissenters burned at the stake after restoring England to Roman Catholicism. Her dad, Henry VIII, had created the Church of England to allow a tricky divorce and after death if he didn’t actually explode in his coffin (that was William the Conqueror), his coffin did at least spring a leak of “corrupted matter of a bloody colour” big enough to provide a tasty treat for some dogs who stopped by at Syon House (fulfilling a Franciscan’s prophesy that dogs would lick his blood as they had done to Ahab). Charles I was beheaded but his head was sewn back on afterwards, Henry I ate a surfeit of lampreys, which proved fatal. Various rumours of syphilis, leprosy and madness have been muttered about royals though the ages, while whispers about freakishly deformed relatives kept hidden from sight endure. Ghosts of monarchs are far more accessible to the public than the living ones are if the hauntings of The Tower of London, Hampton Court and Windsor Castle can be believed. The most famous of these stories revolves around Glamis Castle, childhood home of the Queen Mother. No one knows for sure whether there was any historical basis for the Monster of Glamis but considering two of the Queen Mum’s Bowes-Lyons nieces were declared dead and secretly committed to a psychiatric hospital because of mental retardation, it doesn’t seem too farfetched. Remember those fun times we used to spend in front of the mirror, with friends, in the dark...trying to invoke the vengeful murderous spirit of a long dead, childless, queen? Those were the days. As we already know, (thanks Minky! ), over 450 years ago, to the day, the real "Bloody" Mary I Tudor, Queen of England, died. Mary earned the moniker "Bloody" through her persecution of Protestants - burning 300 heretics at the stake during her relatively short 5 ½ years on the throne. Some believe the chant "Bloody Mary, Bloody Mary, I killed your baby" references Mary's inability to conceive a child and heir to the throne. She was also reputed to be bat-f%&k crazy in both her zealous religious beliefs and fervour for getting knocked up (resulting in not one, but two hysterical pregnancies). Not feeling the creep factor yet? Here's some more. Some have interpreted several of Nostradamus' prophecies to refer to the fall of Blood Mary, often with references to her bloody reputation used as confirmation of the connection. Legends say summoning Bloody Mary in a bathroom mirror successfully will result in a full manifestation of her spirit and she will proceed to rip your face off, or kill you in some other gruesome, grotesque, and gory manner (huzzah for alliteration!). Now we all know that this sounds like a good time, but hysterical pregnancies and questionable sanity aside, it doesn't necessarily mean that Mary I is the historical figure of this myth. The legend is also linked with Mary Worth, accused of killing her children and committing suicide out of grief or guilt, or even more happily being executed for crimes she may or may not have committed. There is little to no historical evidence for any actual figure by this name, accused of the same crimes. There are gads of variations on this type of summoning. Some reference the Bell Witch instead, and who can forget the 1992 movie classic Candyman. We'll let the psychologists weigh in on why we're so fascinated with summoning stuff that will murder us. Interestingly, an intensive googling for French ghosts (or fantomes if you're feeling fancy) will throw up ghosts in Quebec or New Orleans, but there does seem to be very little information on French spirits. That said, although it takes some digging, the French must believe in ghosts if there's a website called Paranormal French Network. Would you haunt your first crappy job? I know I wouldn't but some believe Clark Gable would. Clark Gable, best known for his role as Rhett Butler in Gone with the Wind died on this day in 1960 (exactly 50 years ago today...spooky). Some think he haunts the department store in Portland, Oregon where he worked before he became a star. Like the banshees of Ireland (or for some of the lower classes, "The Knock") the Samoans have a phenomenon that predicts the imminent death of a family member. It's a loud clicking sound that can be heard throughout the house of someone soon to die. Story of our name and other spooky selections soon to come.